The art program at Cranberry Elementary School is designed to meet New Jersey State Core Curriculum Standards, as well as, to fulfill our district’s own art curriculum. All students visit the art room on a weekly basis with their classes. Kindergarten students visit the art room for 30 minutes, first through fifth grade students visit the art room for one hour. Here we experience a variety art media including drawing, painting, sculpture, clay, printmaking and fiber art. Through their art students are able to express their imagination, communicate ideas, gain cultural and historical understanding, and develop fine motor skills along with aesthetic awareness. Art allows us to embrace our individuality and express our feelings and thoughts through various mediums. Through art students make choices to strengthen their problem solving and critical thinking skills. 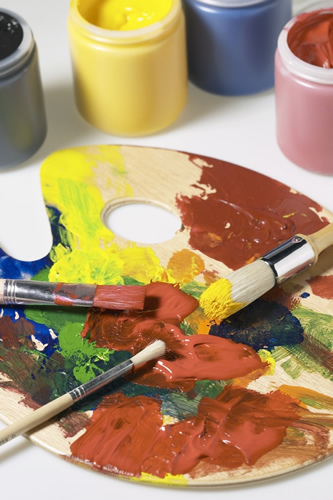 Often art incorporates and reinforces other subject areas in which many lessons are integrated with science, language, social studies and math. The opportunities in the art room are endless for students to feel successful and build self-esteem. My intent is to foster the creative spirit and allow individuals to grow and develop their desire to create. Students are introduced to art history and artwork of the past and present, exploring cultures and relevance. Lessons are often based on periods of art and the artistic styles along with the basic principles and elements of art. In addition to my program, Art Goes to School is a district wide parent volunteer program which helps facilitate art appreciation by visiting the art room for one week to discuss various pieces of art. Please refer to the AGTS website for more information. During the school year I retain many pieces of artwork from each student to transform the school at the end of the year for an annual student art show showcasing every ones talents.